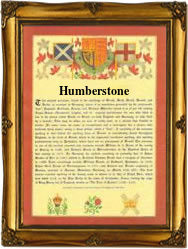 Recorded in a number of forms including Humberstone, Hummerston, Humberston, and Humburton, this is an English surname. It is locational and derives from one of the various places in the counties of Leicestershire and Lincolnshire called Humberstone, or in Yorkshire the "lost" medieval village of Humburton. Humberstone in Lincolnshire is named from (and quoting the Linconshire Church Notes of 1643), "a great boundary stone lying just at the place where the Humber looseth himselfe in the German Ocean!" The Leicestershire village name originates from a totally different source. The first element is the pre 7th century Anglo-Saxon personal name, "Humbeorht", deriving from the words "hun", meaning a bear cub and "berht", bright or famous, with the element "ton". This gives us Humbeorht's settlement or farmstead. The Yorkshire village has yet another origin. First recorded in the famous Domesday Book of 1086 simply as "Burton", a word meaning originally the fortified manor, but later the main farm, it is recorded in 1224 as Hundesburton. This may mean the "hounds farm", possibly a reference to hunt kennels or the like, or as the house of a person called Hund. Early examples of the surname recording in early church registers include: Thomas Humberstone of Aston, Near Sheffield, on May 23rd 1560, Simon Humerstone, who married Anne Baylie on April 15th 1611, at St. Gregory by St. Paul's, in the city of London, and William Humburton, at St Johns Shoreditch, on January 20th 1698. The first recorded spelling of the family name is believed to be that of Ralph de Humberstein. This was dated 1180, in the Pipe Rolls of Lincolnshire, during the reign of King Henry 11nd of England, 1154 - 1189. Throughout the centuries, surnames in every country have continued to "develop", often leading to astonishing variants of the original spelling.